The best home for a lory is without doubt some type of outside aviary. Large enough for the lory to exercise by flying more than just short distances. This usually means an aviary at least four metres in length with clear flying space from end to end. Usually located in a garden such an aviary will be exposed to the elements and the lory will experience sunshine, wind and rain. There will need to be some sheltered area in the aviary where the lory can escape the harshest extremes of the weather and it is usual to provide a nestbox apart from perches located in the sheltered area. Normally one end of the aviary will be covered over and somewhere there will need to be an extrance door. The aviary will often be designed with a double door entrance area to minimise the risk of a bird escaping. An ideal larger aviary is not always possible and some compromises may need to be made resulting in a smaller aviary, suspended aviary or using some sort of cage, large or small. It has been suggested that the smallest practical aviary for a lory would be about 2 metres long by 1.8 metres high by 0.9 metre wide. This will still allow the lory to fly but only a metre or so. 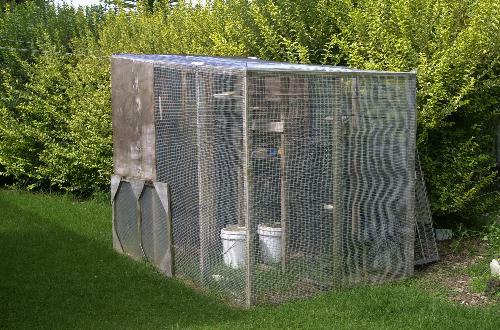 Aviaries can be constructed from a variety of materials. Many find that wood for framing is easy to work with and using standard 45mm to 55mm square treated fence rails is quite common in aviary construction. Since these normally come in 2.4metre lengths it is not too difficult to minimise cutting by designing the aviary to be 2.4metres long and 1.2metres wide by 1.8 to 2metres high. Sheets of 7mm plywood also come in standard sizes of 1.2metres wide by 2.4metres long so again with minimum cutting these can be used. Galvanised 20mm, 25mm and 30mm square wire is available in 30metre rolls and either 915mm wide or 1215mm wide. This wire is ideal for aviary construction. There are differing views about this but apart from the obvious advantage of preserving bare wood some say that painting creates a more visually pleasing aviary (ie looks nice!) and that by painting aviary wire black the enclosed bird's plumage will be more visible and colourful. 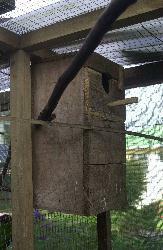 If the wood aviary frame is made from treated wood then painting could keep the birds away from peeling and sucking the wood and perhaps consuming some of the treatment chemicals. One good reason for painting galvanised wire is that it will be less likely to oxidise creating that white zinc oxide powder that some birds seem prone to licking (with resultant poisoning). Non-toxic paint must be used, most modern outside roof paints are non toxic and non-metallic based, paints designed for where children come in contact with them on toys are also non-toxic. Make doubly sure about paint before using it as birds will definitely pull at peeling and loose flecks of paint. Also for this reason painted surfaces should be checked and touched up where necessary. Here is an example for constructing an average single garden aviary, sizes have been calculated to minimise the cutting of wood and to use standard materials wherever possible. It is assumed the final location for the aviary has been prepared and is flat, well drained and in a semi shaded position, away from severe winds and stormy weather. The front of the aviary should, if possible, be towards the sun during the day - in southern hemisphere this means pointing approximately northwards. Of all the materials listed below the roll of wire should be obtained, if possible, several weeks before construction begins. It should be left in the garden where it can be rained on to allow the zinc plating to oxidise and weather down. Hosing it down several times in hot weather and also scrubbing with a weak vinegar in water solution will help seal and oxidise the clean zinc and remove any flaking, cracked, or spikes/feathers of zinc left from the hot zinc dipping process when the wire was manufactured. one 30metre roll of galvanised 18mm, 20mm, or 25mm square section welded wire, 915mm wide -the larger 1215mm wide wire can be used but then many meaurements given below would have to be altered so that the wire would not need to be excessively cut to size (and a lot of offcutts wasted!). tools needed are claw hammer, electric drill and 3mm to 6mm bits, saw - preferabley an electric circular saw, 4 metre or longer tape measure, straight edge at least 2 metres long, pencils/markers, screwdrivers/screwdriver bits for drill and cutters/pliers for galvanised wire. Woodbark, often used as a weed suppressing cover in gardens, sometimes on top of black plastic. This will eventually will rot down and can just have more added on top, weeds and greenery will also eventually grow through it. Birds seem to enjoy playing on woodbark. The need for some type of roof cladding or covering will depend on the aviary design and its location. Usually most wood constructed aviaries will not be completely waterproof and it may be necessary to use some roofing cover such as plastic or metal corrugated sheets and perhaps appropriate drainage guttering and spouting. With a sloped roof design aviary, where the covered area is roofed with wood (plywood or other wood sheet etc..) it may be sufficient to seal joints, cover joins with metal weatherproof edgings and cover with a few coats of paint. 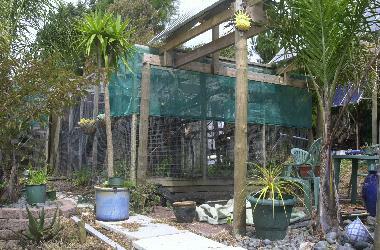 With near flat roofed aviaries the simple method may be to use some corrugated sheeting. It should not be necessary to completely roof over an aviary as lories will enjoy rain showers especially after a dry period. Leaving an area of a wired over aviary roof open to the elements will suffice. An excellent idea. The main problem is that lories tend to be vary hard on plants and can soon reduce them to a dead stripped stalk or two. If the aviary is large enough to allow a tree/bush or two to be incorporated, at aviary construction time or planting later, then this will provide a quite natural setting for the birds. Newly planted shrubs will often need to be wire prtected for some time until they are established and getting quite large. 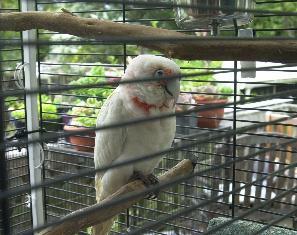 Smaller potted plants can be introduced and the lories allowed to feed and strip them. Hanging put plants of the non-succulent types including flowering plants and ferns will prove quite popular. With the concrete or stone covered aiary floor the use of large plastic tubs may be necessary for introducing plants. 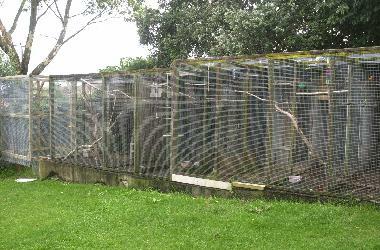 Some examples of aviaries, all home-built on site to suit the available space and number of birds are shown below. A neat setting of three aviaries. Array of 8 aviaries being expanded. A double aviary with one entrance and secure area with doors into each aviary. Where time and/or labour skills are not available to construct an aviary then purchasing a pre-built avaiary may be a convenient and quick option. Many sizes and designs are normally available and obviously the larger ones are more expensive. Selecting an aviary and seeing what is generally available may mean visiting a few of the larger pet stores specialising in pet birds. These are nearly always intended for outside location in a garden or on a deck. Most will be constructed of wood, plywood and galvanised welded wire and are available in various sizes and designs. These are ideal where there is only a few birds, perhaps one or two breeding pairs in the smaller double aviaries. The only disadantage with a new pre-built avairy is that you are limited to what is available unless you are prepared to pay extra to have a custom design constructed. 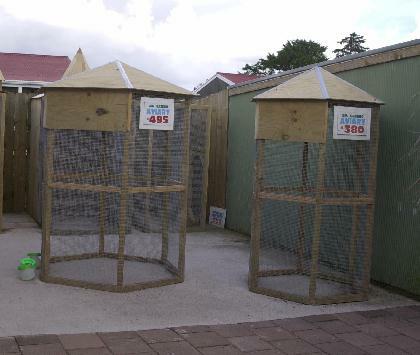 One such supplier (and manufacturer) in Auckland, NZ, is the Bird Barn (Lincoln Road, Henderson, Auckland) and pictured below are two small octagonal aviaries and a larger retangualr type with plywood sloped roof area at rear. 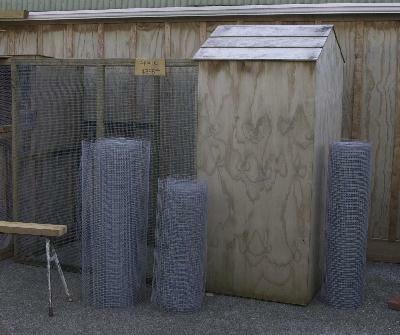 Suppliers of metal framed aviaries such as Millenium Aviaries NZ supply a range of standard sized aviaries manufacted with metal framing, in kitset form. They will also build customer designed aviaries and cages. Metal aviaries tend to be more expensive but are easy to extend as many are of a modular design permitting various shape and size options in the final product. Apart from a new avairy there always seems to be a selection of second-hand ones available and advertised in local newspapers (and Trade & Exchange). Some pet stores will have notice board ads where avaries may be advertised and they may actually have used aviaries for sale. Such aviaries tend to be under 50% of the new avaiary price but transportng it to your location may be an issue as pet stores can often deliver a new aviary whereas a private purchase may mean organising delivery - the cost of which could be substantial so needs to be accounted for when deciding what to pay for the second-hand aviary. There are also several other issues apart from price and delivery that should be addresed. Inspect the aviary frame and wire, making sure all is secure and in good condition. Doors, hinges and handles/locks need to be working, watch for sticking twisted doors and look for gaps/holes around doors and frames. Check wire is not rusted or has loose zinc galvanising as this could mean replacing wire. If the wood frame is painted then make sure there is no rot hidden by paint, especially if the aviary has just been freshly painted. Look for insect infestation such as ant nests, weevils, wasps etc. these can indicate problem areas such as nooks and crevices which could become reinfested. After purchasing a second-hand aviary everything should be scrubbed clean with disinfectant including nestboxes, perches, shelves, toys and any other accessories provided. The aviary walls, roofing and wire needs great care in cleaning to remove all traces of previous occupants feathers and fragments, excrement and food stains/spoiled food stuck in crevices etc.. Try to find out as much as possible about the previous occupants, if they died from disease, what was it? The seller may not want to admit to this but you must assume the worst and clean accordingly - just imagine if the previous birds died from PBFD (Beak and Feather disease), you will certainly take cleaning very seriously. Unless nestboxes are in very good general condition and can be thoroughly cleaned it may not be a good idea to take them. These are where disease is likely to be introduced, everything from bacterial and fungal problems (which a good disinfecting will definitely remove) to horrors such as Polyoma Virus and Beak and Feather Virus which are just not so easy to eradicate. 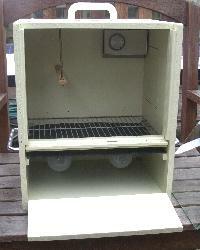 Old nestboxes, perches and other aviary furniture should normally be discarded and if possible burnt. 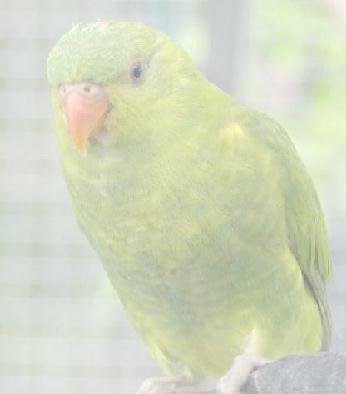 If an indoor or outdoor aviary is not an option for housing a lory then a cage of some type is second best. Birds in cages MUST be kept indoors as a cage will not offer sufficient protection from the elements and will certainly not have enough room inside for a nestbox. The cage should be located in a draught free location and not be placed in an area where it can become excessively hot or cold, or too close to a fireplace, heater or in direct sunshine. Fumes from heaters and the kitchen should also be avoided and certainly anyone who smokes should keep the bird well away from tobacco smoke. Of course in fine weather the caged bird may appreciate being outside on a deck or in the garden for a while. The change in surroundings will be a new exciting experience for the bird. The most popular cages for a lory or two is the size shown in the centre photo below. These are about 600mm high by 450mm square and cost (in NZ$) from $90 upwards to $200 depending on the design, finish and actual size. They usually come with one or two wood dowel type perches, two plastic food/water dishes that clip in the cage bars and a plastic removeable base tray. Entry to the cage will normally be via two hinged up panels on the cage top as well as the normal door on the front side of the cage. There is often two smaller doors of slide up panels where the plastic cups are located so that food and water can be easily placed. One point worth noting here is that the intelligent lory can often learn to lift these panels and make an exit, sometimes even when they are held closed with a clothespeg. Wiring closed with thin wire (fuse wire) and using plastic cable ties is more secure. 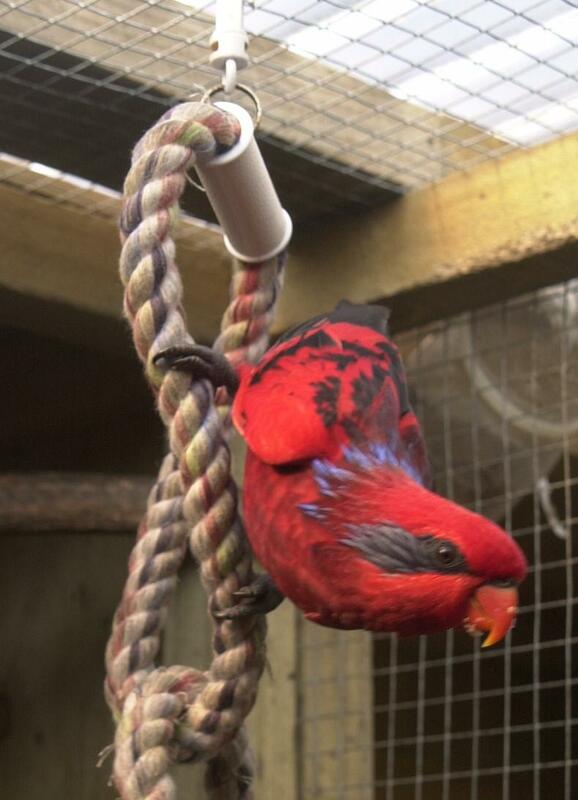 By far the best type of cage for a lory is the metal constructed welded bars type which generally come in minimum appromimate sizes of a metre wide, 450mm deep and 700mm high. They often have a slide out metal tray in the base and can be supplied with supporting legs (see example in photo below right). These type of cage can cost (in NZ$) from several hundred dollars to well over one thousand dollars and range in finishes from powder paint coatings to chrome or bright stainless steel. With all of these cages there is always the problem of cleaning since the lory squirts liquid poo (because of its largely liquid nectar based diet). Unless there is some sort of protective covering this poo will quickly soil the immediate area where the cage is located. 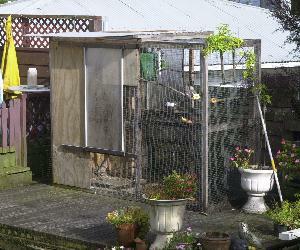 To minimise this problem the lower sides of the cage can be covered with plastic or glass sheeting. If the cage is placed next to a wall then an old sheet, towel, curtains or even newspapers can be hung to protect the wall. The same applies to nearby furniture, carpets and other items that need to be protected and often some creative thinking is necessary to try and overcome this squirt problem since a lory can often squirt as far as a metre. In general no matter what size cage is used the lory will not be able to get any meaningful flying exercise. Therefore any caged lory should be taken out of its cage for an hour or more per day for playing and exercising in a larger confined space - ie room with closed door and windows such as a sunroom or a garage. Playtime with its adopted human is very important for a single lory, it will consider itself part of the human family and as such expect attention and to participate (by playing) in family activity. The risk of boredom is much higher with a cage confined bird so it becomes very important to have as large a cage as possible and include a variety of toys. There should be sufficient toys and activity items without cluttering the cage. Changing toys from time to time keeps the lory interested and introducing the occasional new toy becomes a major investigation activity for the lory. Pictured below are several cages, the leftmost is barely big enough for one lory, the centre one is ok for one lory and just about big enough for a non breeding pair. 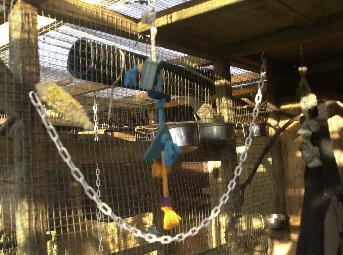 Birds kept in either of these would need daily or more frequent sessions outside their cages. 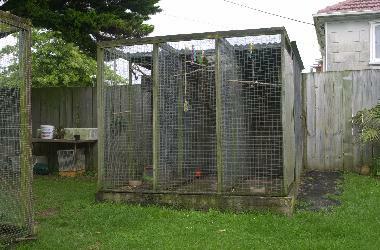 The righmost cage shown is much larger and in this case was used to house young lorikeets just getting ready to fledge. Five can be seem in a line on the perch (Musk and Scaly lorikeets) with Red-collared lorikeets at the bottom right of the cage. Such a cage is the best option for caged lories and suitable for a breeding pair. Nestboxes serve two main purposes, somewhere for the lories to seek shelter in the worst weather conditions, and somewhere for the hen to lay and incubate eggs then raise the young birds until they fledge. Bonded pairs of lories will usually sleep in the nestbox instead of staying on a perch overnight. A nestbox needs to be of aedquate size for the particular birds, with an entrance hole of suitable size and contain suitable nesting material that will remain dry. It should be located in the avairy so that it is protected from rain, be at an acceptable height for the lories and be easily accessible. There will normally be a short perch or platform below the entrance hole and this will also extend inside the nestbox so that the bird can peek outside before making an exit. 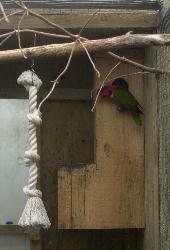 Most vertical designs will have steps or wire on the inside to allow the lory to climb down to the actual nest chamber. There are many different designs of nestbox that try to take into account the needs of paticular types and sizes of lory. Other factors such as protecting eggs from accidental breakage - perhaps by a bird dropping on top of them or an excited male stomping them - may be considered in the design. The nestbox should also be easy for a human to look into and check on eggs and birds. This will mean some type of inspection door or removable panel. 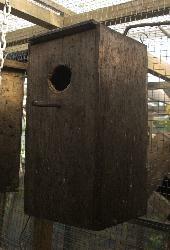 Low cost nestboxes tend to have a simple hinged lid or a removable lid, these can be very inconvenient if placed high in an aviary as a ladder may be needed to look inside. Side entry doors or hatches and hinge down front panels are more convenient. Just about all nestboxes are constructed from wood and use sawdust and/or wood shavings as nesting material. The images below show some typical designs for lory nestboxes. Most can be made by the aviculturist but for convenience they are often purchased from a pet supply store. The most common nesting material is sawdust or wood shavings. These should be from untreated wood and dry when placed in the nestbox. With a breeding pair of lories who successfully hatch and raise young the nesting material needs to be inspected often while there are young in the nestbox. The young will soil in the nestbox and the nesting material can quickly become a soggy mess, this in turn can make the young cold and risk their survival. 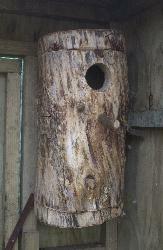 Nestboxes should have several drainage holes beneath the nesting area to allow excess water to drain away. Nesting material should be changed ocassionally although probably not if there are very young birds in the nest as this change may upset the parents and could result in the young being abandoned or worse, being killed. Usually there is no option but to purchase wood shavings or sawdust from a pet store but often sawmills and manufacturers using wood will be glad to have sawdust removed and may package it into large plastic bags or allow it to be collected. This may need to be dried before use but is still worth the inconvenience considering the money saved. If there is enough free sawdust available then it is also excellent to spread on concrete aviary floors. The most simple is just a rectangular box with an opening lid, or opening front panel. To minimise wood cutting and fitting, a length of standard 250mm (10 inch) wide 20mm thick untreated boxwood is used. A small piece or galvanised wire mesh is needed and a short, about 120mm (4 inch) piece of branchwood about 10mm (3/8 inch) in diameter. This will be used as a perch below the endtrance hole. About 18 by 40mm long No5 screws for particle board are needed. Two of 350mm, two of 370mm, two of 290mm. The base is one of the 290mm sections. Place it on a flat surface. On top of this the four longer sections will be placed, one along each top edge of the base. Start with the 250mm wide ends of the base and place on each an upright 350mm section. Then one the 290mm edges place the two upright 370mm sections to form an enclosed box. Drill holes and use the 40mm screws to join all sections. Now about a third way down in the centre of one of the 350mm sections drill a pilot hole then usinga hole-cutter make a 50mm (2 inch) diameter hole. About 30mm below the lower edge of the hole make another hole through which the perch can be tightly pushed. About 50mm of the perch should protrude both inside and outside the box. Where the perch protrudes inside the box staple a length of wire mesh just below the perch almost to the bottom of the box. Bend the wire out from the wood slightly so that the birds can use the wire to climb up to the perch and entrance hole. If it is easier to do then the entrance hole and mesh stapling can be completed before the box is assembled. Last is the lid. This should fit over the top of the two 250mm upright sections (front and back of the nestbox) and between the two sides which should be prtruding up by 20mm above the height of the front and back. With the lid in place a hole should be drilled either side at the back top corner of each side panel and screws used to through each side into the rear side edges of the lid. Do not tighten the screws too much as they are the hinges that allow the lid to open and close. It may be necessary to bevel the back lower edge of the lid to allow it to open and close easily. 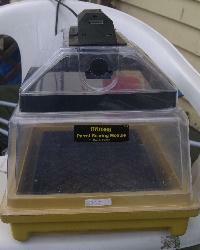 In the base of the nestbox drill six to eight 8mm to 10mm holes to allow liquid to drain from inside the box. 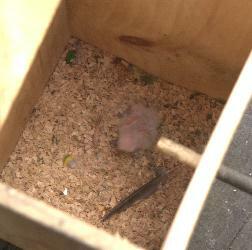 Last place about 30mm depth of dry untreated sawdust/wood shvings in the bottom of the box. It is now ready to be mounted in an avairy for use. It should be placed in such a way to allow the lid to be opened so that the contents can be inspected. It is not necessary to paint the nestbox. A simple variation on the above design is to have the top part of the front panel hing outwards and downwards instead of having a hinged lift up lid. Before assembling the box with the front panel in place, this is one of the 350mm sections, cut it into a 200mm and a 150mm pieces. Make the entrance hole in the centre of the 150mm section with perch hole below it. Assemble the box screwing the 200mm section in place. The lid should be screwed down from the top into back section top edge and through the upper sides of the side sections into the side edges of the top. The section of the front with the entrance hole should now be placed in position and a 60mm to 75mm hinge connected to the outside to enable this section to hinge outwards and downwards. A small wood lever, metal catch/bar or even a loosely fitting nail through one of the side panels into the upper left or right edge of the hinging section can prevent it falling open. With this design the nestbox can be placed even higher in the aviary and inspecting inside may be more convenient. Slightly more complicated but still easy to make. Adjust dimensions to suit height needed. Apart from the different shape the main advantage of this design is that the egg chamber is not directly below the entrance hole and a bird coming into the box is very unlikely to drop down and break eggs. A removable inspection lid can be made over the lower part of the 'L' making it quite easy to see directly into the egg chamber. one 300mm which is the removable lid plus one narrow offcut about 100mm. Place the 500mm base on a flat work surface. Assemble on one 500mm edge of the base a 700m upright and to the left of this a 250mm upright. Two screws through these into the edge of the base should secure them. Repeat on the back edge of the base so that the 700mm uprights are facing each other. Now at the rightmost top edge of the base, between the two 700mm uprights place the 650mm upright. This will need to be secured with a screw up through the bottom of the base in to its lower edge and two screws through each 700mm upright into the vertical edges of the 650mm upright. Now at the left end of the base place the 225mm section between the two 250mm uprights and again secure with screws, one up through the base and one each through the ends of the 250mm uprights into the edges of the 225mm section Now the 'L' shape is taking shape the last two sections to be fitted are the top and inside L filler part. The 450mm filler should be the last upright to complete the vertical part of the 'L' shape. This should be fitted so that it is lever withe the top edges of the existing three uprights then screwed in place via two screws each through the 700mm front and back uprights into the edges of the 450mm filler. Last the top should now fit exactly over the top edges of the four uprights and should be screwed into these. Only the removeable inspecion panel is left. This should also fit fairly exactly over the top of the lower 'L' section completely eclosing the nest chamber. To secure this in place no a small approx 100mm wide section should be screwed to the lower side of the panel, along one of the 300mm edges, centered (as it will be 250mm wide) so that about 50mm of the width is protruding out past the edge of the inspection hatch. The hatch can now be placed in position so that this 50mm protrusion fits underneath the lower edge of the 450mm filler and secures the hatch in place. 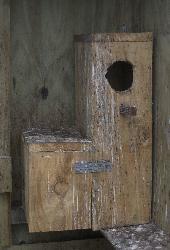 The two leftmost iamges below show two L shaped nestboxes, both have entrance holes in the upper front panel and are secured in a reverse L position. The nestbox could be mounted in either orientation depending on where the entrance hole is located. To allow mounting in either way the hole could be in the upper 450mm filler section instead of either of the 700mm side uprights. on wood shavings and feathers. These are essential items for the cage or aviary. Most new cages will come with a perch or two (or more), usually nothing more than a length of wood dowelling with slots cut in each end for placing over the cage bars. Sometime cheaper moulded plastic is used. These are perfectly aedquate but quite boring for the bird. 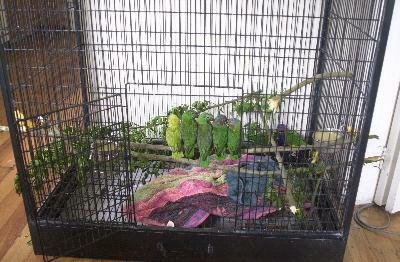 More natuaral perches made from tree branches are easier to install in larger cages and aviaries and are also easy to deisgn and make. Perches can be made from almost anything as long as the bird can get a grasp with its feet and relax or snooze/sleep while on the perch. Wood is the best material to use although not treated, painted, polished or otherwise preserved wood of any type. Lories will enjoy chewing and licking perches so anything likely to injure or sicken the lory must be avoided. Metal rods, shiny plastic rods, plastic covered cables such as old electic cables, clotheslines of the plastic covered cord or wire type, common multistrand galvanised wire, fencing wire and generally wire of all types are NOT suitable to make a perch. They will tend to be too insecure, endanger the bird if it can chew off and consume any of the material, and be of too small a diameter for the bird to grasp and perch on. Wire may also present a danger in that the bird may not see it and injure itself when flying. Some perches are made from abrasive materials and these serve the additional purpose of keeping a bird's toenails from growing too long. These can be quite simple and consist of nothing more than sandpaper wrapped around and pinned to a plastic or wood dowel. Some specially designed perches are made from a hard plastic moulded to provide an adrasive surface or made from an abrasive stone material such as pumice. These will tend to wear away in time and need replacing. Sometimes in larger aviaries instead of placing many separate perches a tree limb with many branches complete with leaves is used instead. This is probably the most natural way of providing perches with the additional advantage of providing great excitement for the birds who will enjoy playing in and stripping the foilage. No matter what size of large cage or aviary is used, the occasional tree limb (of a suitable size) is an excellent addition, removed once stripped and the wood dried up. Making perches is real easy, something that anyone can do at just about negligible cost. The lory will enjoy something different as perches can be renewed on a regular basis. If trees are available then simply use branches that have been pruned, usually in every neighbourhood there will be trees that have been removed or pruned back making potential perch material easily available. In selecting a branch discard rotten or bug infested parts and sections with lichens or other parasitic plants. Growing buds and smaller offshoot branches need not be removed but the branch should be generally clean. It may be an idea to wash it down with a brush to remove any pollution or possible sprays used on the tree - especially with fruit trees. If there is leaking sticky sap deposits then these can be left if not too large. Larger deposits should be removed as the lory could get it's feet stuck or plumage damaged. Green or freshly cut wood should be used - ie where sap is still fresh, rather than dried up wood removed some time before and the bark has become dry and hard. Green wood will be softer and more enjoyable for the lory to strip. Measure the length of perch needed and neatly cut the ends. If the diameter of the perch enables it to fit through the cage wire easily then make the perch long enough to slightly protrude at each end. It can then be secured by simply using clothes pegs or more permanently by drilling small holes through each end and inserting a nail to prevent it slipping back into the cage or aviary. 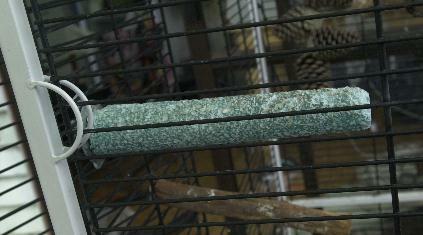 For larger diameter perches the ends can be cut flat to fit inside the aviary between the wire sides. These should then be attached to the wire using a screw from outside the aviary through a large metal washer (or make one from a piece of flat wood/plywood etc. ), that is larger than the cage/aviary wire mesh size. The screws goes into each end of the perch, holes may need to be drilled into the perch ends to prevent the perch splitting as the screw is tightened. This will make the perch very secure. Jamming a perch between avaiary wire is not a good idea as it may stretch the wire and at worst collapse when a bird lands on it. Make perches from all different diameters of material, leave smaller twigs attached to larger branches, even the very tiny ones as often a lory will hang off these even though they bend under the lory's weight. the same applies to foilage, do not strip this off, let the lory have the fun of doing this as this will keep them occupied for hours on end. Some of the more interesting trees and bushes that can provide wood for perches are listed below. The branches from fruit tree and bushes are a favourite with lories as they will often spend much time stipping the bark away and sometimes munching the bark to a fine pulp to extract the juice then tuck the juice into their plumage (anointing). The buds on fruit tree perches are a special delight and lories just love slowly stripping and chewing these. Almost all fruit trees and bushes are suitable, and the following have been used with great success, Apple, Pear, Peach, Plum, Nectarine, Orange, Lemon, Grapefruit, Feijoa and Guava. Although fruit trees provide the best wood for perches others are also suitable. Eucalytus and Camphor tree branches will also be stripped by the lory and are treated just like fruit tree branches, sometimes also anointing their plumage and feet. Various pine and fir trees have branches with a rough texture that make interesting perches for birds. Very often needles (leaves) grow directly from the branch and there will be blobs of thick pungent pine sap either soft or ome lories appear to really enjoy this type of tree perch and a few will even enjoy the strong smelling sap although none will actually ingest it. Bamboo is considered by some as unsuitable for bird perches because it tends to be smooth and slippery and birds have difficulty landing on it or retaining their grip. The opposite can be true in that lories will have great fun with bamboo and will actually enjoy pulling apart and stripping lengths of green bamboo and the growing pointed tips of bamboo. If leaves are left on the bamboo segment joints then these will often be pulled apart and chewed. Watching a lory learn about bamboo and how to land on it is quite amusing. It will rarely get hurt by misjudging how slippery the bamboo is and soon learns a quick grip technique for holding on. One lory actually learned to land at speed on a bamboo perch but instead of trying to stop quickly it gripped to perch and simply spun around in a full circle to loose momentum and came to rest upright on the bamboo perch. Very soon other birds in the same aviary were learning this technique much to the amusement of the humans observing the action. Almost any other tree wood is suitable for perch making, willows, elms, chesnut, oak etc.. or whatever is available. Look for the unusual although bushes that grow spikes or thorns should be avoided unless all of these are removed. Most pet stores will sell a variety of perches ranging from the simple lengths of dowelling to those specially designed to wear down toenails. These are convenient and will often come with the necessary hardware to attach them to the cage or aviary. The main disadvantage is of course the cost as some can be quite expensive especially those made from more exotic materials. When placing branches in an aviary place them in every direction including vertically and at all sorts of angles. A few horizontal perches are ok but branches in every direction are fun for the lory as it will explore every walkable surface - they will even hang upside down from perches and the aviary/cage roof! Allow perches to run alongside food dishes, just outside nestboxes and close to other areas where the lory can hide or sleep. Criss-crossing perches and ones that touch each other or run below or to the side of each other are excellent and lories will establish pathways along and around different perches to reach various areas of the aviary. Leading a perch up to a tube or as a jump off point to a toy (swing or rope etc..) makes interesting alternates to always having to fly to a particular place. 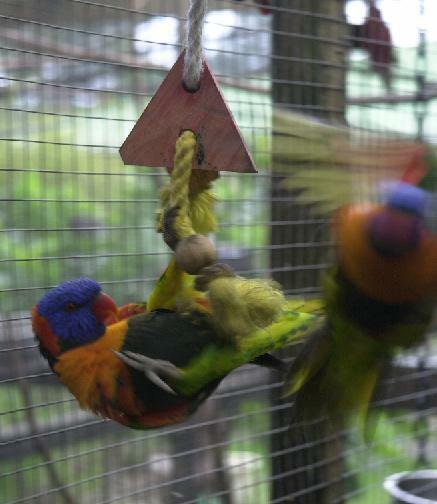 Toys are another essential item for any lory cage or Aviary. These can provide hours of endless fun for the captive lory and help ensure that boredom and stress does not become a problem. The most simple toys are ropes, cords, plastic and metal chains that can hang from the cage/aviary roof, a knotted rope with ends left unsealed is a particular delight for lories as they will spend hours unravelling the rope right down to the individual strands. Reknotting these starts the whole exercise again. Swings made from wood, metal, rope, chain, etc., again a fun item for the lory as swinging seems to a nice relaxation. Places to run through and hide in, such as plastic tubes, wooden tunnels, old wood boxes, plastic bottles with an end cut off, etc., items such as these are especailly neat in an aviary where there are several birds as all sorts of chasing and hiding games take place. Smaller lorikeets such as Musks spend endless hours squabbling inside plastic tubes or play defending hiding places. An old tee shirt or wooly jumper hanging from a perch or from the roof is somewhere lories can get inside and explore or sometimes just sleep in. More complicated toys can range from climbing frames such as ladders, suspended blocks of wood with many appendages, bells, chimes, plastic wheels and balls etc., some lories are fascinated with the noise of small bells inside plastic balls, the sound of wooden wind chimes, and anything that makes an unusual sound. very often they will eventaully mimic these sounds. Making suitable toys is quite straightforward, the most simple is the knotted rope and one that provides a lot of fun and a suitable squabbling-over platform if there are several birds in one aviary (especially musks and/or scalies). Swings can be made from a variety of materials, they usually have one or more horizontal bars supended in some way from the roof so that it can swing quite easily. Try rope/cord swings, old wire coathangers reshaped to a swing. 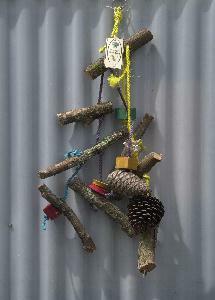 A hanging wood block toy, simple a knotted rope with an oddshape piece of wood threaded on above each knot, try short sections of fruit tree branch or pine cones, opened and closed, threaded on rope along with old keys and washers, these all make excellent activity toys. 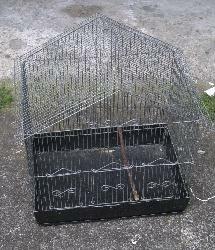 These are specialised cages designed for a specific purpose. If you need to transport a bird then sending a full size cage is usually not practical or economical. Usually a bird should be in a small transport cage for no more than a day. 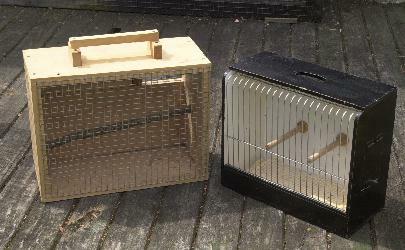 Below are pictures of two small transport type cages, the larger is a home made type with a wire mesh front and is substantial enough for couriering birds overnight. It has enough room for two birds with sufficient food and water. The second is a smaller commercial type and is a short distance transport cage more suitable for taking birds to visit the vet or moving to other aviaries no more than an hours distance away. Both cages are small enough so that the bird will not attempt to fly. Hospital cages in common with brooder boxes/cages are usually a sealed container in which the temperature and humidity can be controlled. 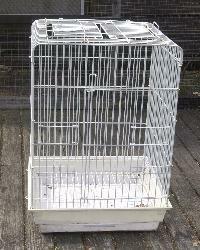 Since keeping a developing or sick bird at the correct temperature this type of cage is essential for the aviculturist as at some time or another it will be necessary to hand raise a baby bird or treat a sick bird. Many commercial designs are available and they come with a variety of features The more modern types tend to be manufactured from plastic and are easily taken apart for cleaning. Older types are often made from wood and glass. There is a small lcd digital thermometer and a temperature adjustment control in this top cover. It is constructed from plastic with two layers separated by an air gap to provide insulation. The bottom tray, sidewalls section and top cover separate for easy cleaning. It is provided with a plastic grid tray cover. Overall lightweight and functional the model shown did not come with the optional humidity controller which attaches to the side of the unit. 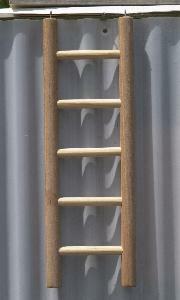 Available in several sizes, this particular size unit is ideal for up to four baby lories (at about the same age). Shown on the right is an older but equally effective hospital cage made from painted wood with a removable glass front. There is the main bird compartment at the top and underneath a smaller compartment where there are two 40 watt incadescent light bulbs used as a heating source. Heat from these is transferred via a sheet of black painted aluminum that separates the upper and lower compartments. An adjustable thermostat inside this compartment measures temperature and controls power to the light bulbs. Two bulbs are use to minimise problems in the event of one failing. 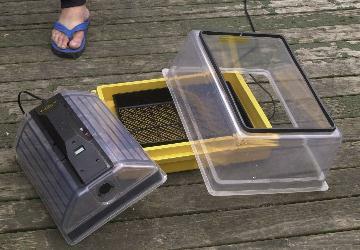 An additional thermometer and humidity meter are normally kept inside the bird compartment and if needed a small jar of water with a fine wire net lid is included to increase humidity. This additional thermometer is needed as the thermostat settings are only accurate to within a few degrees C.
With inside dimensions of 300mm by 200mm by 150mm this hospital cage allows up to four baby lories to be raised from about 8 days old. Both of these units are also ideal as hospital cages where it is essential to provide a controlled heat/humidity environment for a sick bird. Tile pattern: Cinnamon mutation Scaly-breasted lorikeet. Last modified: 19 May 2002.